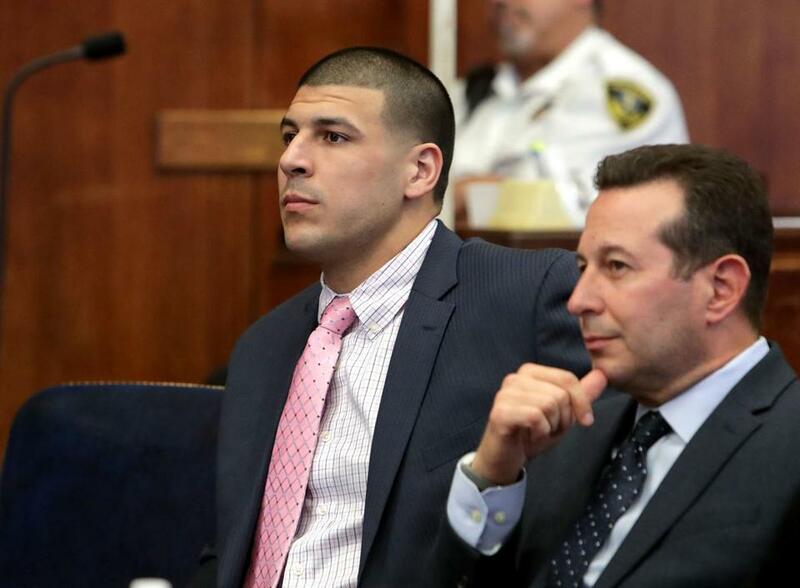 Aaron Hernandez (left) with attorney Jose Baez attended a hearing earlier this month in Suffolk Superior Court. They are the lead characters on crime drama television shows like “CSI” and “Law and Order,” the forensic scientists who connect a serial killer to a latent fingerprint, a psychopath to a bite mark, a bullet fragment to a gun used in a triple homicide. But in real life, the scientific methods behind forensic investigations have come under increasing scrutiny in recent years, a growing legal issue as defendants across the country challenge convictions based on evidence that, once considered infallible, was later determined to be erroneous. The scrutiny now includes the field of firearms analysis, often called ballistics, after a report last month by the President’s Council of Advisors on Science and Technology questioned whether the science of analyzing firearms is sound enough to support the standard of proof that is constitutionally required for a criminal conviction. The report has already sent ripples throughout legal and law enforcement communities, including in Massachusetts, as lawyers in one of the state’s most high-profile cases – the Suffolk County murder trial of former New England Patriots player Aaron Hernandez – asked a judge earlier this month to toss expert testimony related to a firearm police have linked to the case. The motion cited the council report’s call for judges to be better gatekeepers in deciding what kind of evidence should be presented to a jury. If judges permit such testimony, the report says, they should better instruct jurors that the rates of error among firearms examiners are higher than they might expect. “There are new issues here with the idea of ballistic certainty … there’s not much science to it,” said Linda Kenney Baden, one of the attorneys for Hernandez, who was speaking about firearm analysis in general, and not Hernandez’s case specifically. But the report’s findings have also been widely criticized, especially by those in the forensics field, who argued that the council lacked any representation from ballistics experts. They argued that the council’s findings do not undermine the accuracy of firearms examinations. Defense lawyers for Hernandez said that the issue is ripe for an immediate review by the state Appeals Court and potentially the Supreme Judicial Court. At issue is the process of toolmark analysis, in which examiners attempt to match the physical characteristics of a gun to markings on a spent bullet or casing. Investigators determined as early as the 1800s that a microscopic view can determine whether a specific firearm caused the markings on a specific bullet or casing. In recent years, however, research groups have questioned the science behind the analysis, saying it is more of a subjective review by an examiner than a scientific process. Last month’s government report questioned whether courts have gone far enough in setting restrictions for questionable evidence in forensic investigations, saying jurors tend to believe any statements given by an expert witness. The report called for an independent outside review of testing methods and data, known as a black box study. The debate over firearms analysis caused the US Department of Justice in September to enact new policies prohibiting prosecutors and investigators from using the terms “reasonable scientific certainty” and “reasonable [forensic discipline] certainty” from reports and testimony, unless allowed by a judge. Lawyers for Hernandez are now arguing that the debate should be enough to exclude the examination of the gun recovered by police in his case as evidence at his trial, under a 2011 Supreme Judicial Court ruling that set strict standards for the admission of expert testimony. Superior Court Judge Jeffrey A. Locke ordered prosecutors to report to the court in the coming weeks whether Boston police investigators use the type of “black box” independent review that was recommended by the government report. Earlier this month, a federal judge in Illinois – the first known judge to consider the issue in light of the government report – refused to exclude ballistics analysis in a firearms case, saying an independent review of the testing method, suggested in the council report, was sufficient to support the validity of the examination. Suffolk District Attorney Daniel F. Conley said that prosecutors will present the same argument to Locke in the Hernandez case: That Boston police conduct a sound scientific method in firearms examinations that was upheld by the courts a decade ago. Conley also argues that the method used by Boston police meets the standards of evidence set by the SJC in 2011. “The theory of firearms identification is generally accepted, it’s reliable, and the process can be presented in court and the opinions of the ballistician can be espressed,” Conley said. Legal analysts say that the council’s report is only the latest academic review to question the role ballistics and other forensic evidence should play in criminal prosecutions, noting other types of evidence that have already been discredited in the courts: the analysis of bite marks, foot prints, even char patterns in arson fires. Locally, a Superior Court judge tossed out a Lowell man’s conviction for arson in 2014, after he served 32 years in prison, finding that advances in forensic science raised questions about the methods used in his case three decades ago. Nationally, the validity of latent fingerprint investigations came under review in 2004 after the FBI matched a fingerprint in the Madrid train bombings to an American lawyer, only to see Spanish counterpart match the same fingerprint to someone else. “People may have developed an overconfident view of how much we can figure out using physical evidence, whether it is using supposed experts on bite marks, or fire marks, or ballistics,” said Matt Segal, legal director for the American Civil Liberties Union in Massachusetts. He and other groups have called for the establishment of a Forensic Science Commission in Massachusetts, independent of prosecutors, that would set standards and policies as well as oversight in the the review of evidence. George J. Leontire, another attorney for Hernandez, added that the public’s interest in TV crime dramas has led them to believe that evidence that is introduced in trials is based on infallible science, which tilts the evidence in prosecutors’ favor.